A sales funnel (also known as a revenue funnel or sales process) can be defined as a series of steps designed to guide visitors toward a buying decision. A sales funnel is a marketing system designed to lead someone through a systematic process with the end goal of purchasing your product or service. The basic idea behind a sales funnel is to turn a lead into a prospect, then to turn a prospect into a customer who finally becomes a repeat customer. Difference between leads, prospects and customers? Leads – are people who are aware of your product or someone you wish to pursue for a sale. As the name implies, a sales funnel is wide ontop and much narrower at the bottom. The top represents the vast amount of leads for your product or service. It is not realistic to expect all the leads to become customers as not all of them will be interested in your product or service. The percentage of leads who show interest in the product or service, then become your prospects. The efficiency of your sales funnel, will determine how many of the prospect become customers. The bottom narrow part of the funnel represents the customers. 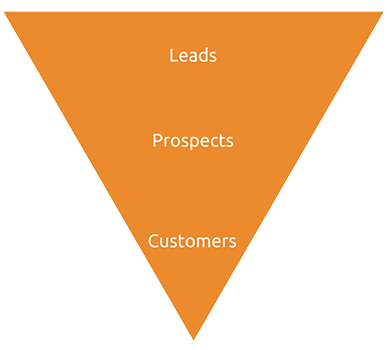 Working your way down each step of the funnel, will enable you to filter out the weak leads (no interest in buying). This allows you to focus energy on ‘qualified leads’ who have greater potential to complete purchases. Sales funnels present businesses from wasting resources on people who are not interested, but instead concentrate efforts on “leads”, who are potential customers. A clearly defined lead generation strategy for a business encompassing landing pages and follow up emails, will greatly increase the number of qualified leads, prospect and eventual customers that your sales funnel produces. A real life example of a business making use of a sales funnel is Armani. Armani is an Italian fashion brand founded by Giorgio Armani. Armani designs, manufactures, distributes and retails haute couture, ready-to-wear, leather goods, shoes, watches, jewelry, accessories, eyewear, cosmetics and home interiors. Armani has a very clear email opt-in on their website. It si shown to all new vistors on their website irrespective of their page of entry. This email opt-in is a clear and effective strategy to build an email list. It is also not a distraction as users can simple close it and then it does not appear again. Step 2: A newsletter pop-up on the first page visited by the lead. Armani have a clear and elegant design making use of the “Golden rule of Three”. This rule states that the checkout process should at most be three clicks away from any page on the website.